Archives of Eaton Bray News for January 2005. This article was published in January 2005. Please see Latest News for more recent information. The Edlesbray Players have thrown all their eggs into one basket when they take to the stage this week in the classic pantomime Mother Goose. Forget the traditional tale of a goose that lays golden eggs - this production, written and produced by theatre stalwart Val Trantum, almost features a cast of thousands with appearances by Harry Potter, Frodo, Mary Poppins, Pooh, and a bunch of aliens. The show runs at Eaton Bray Village Hall from Thursday until Saturday. A Panto audience will get to have a gander at the refurbished village hall in Eaton Bray when Mother Goose is performed at the venue next week. Members of the cast are pictured. The Edlesbray Players are treading the boards for their 12th annual pantomime, written and produced as usual by Valerie Trantum. Performances are on Thursday to Saturday, January 20-22, at 7.30pm. In addition there are matinee performances on Saturday and Sunday, January 22-23, at 2pm. After the pantomime, the company will embark on preparations for their next production, a review celebrating the 60th anniversary of the end of World War Two, on May 7. 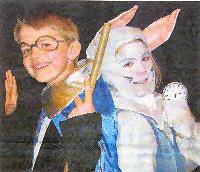 The players were established in 1993 and put on their first panto Cinderella the following January. Originally called St Mary's Panto Group, it changed its name in 1995, when the players put on a review to mark the 50th anniversary of VE Day. The group incorporates a strong Young Players section which this year outnumbers the older actors. Panto tickets, priced at £5 for adults, £2.50 for children and £4 for concessions, are available now. 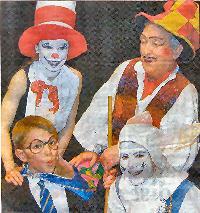 The new website www.edlesbrayplayers.co.uk tells the history of the company and previous pantomimes. Welcome to this blog which will hopefully give you more information about the village of Eaton Bray in Bedfordshire. You are viewing the January 2005 archive.